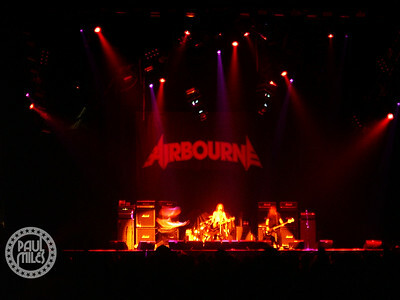 Airbourne's first-ever tour of Japan in October 2008 supporting their Runnin' Wild debut album. All photos in this gallery are Copyright © 2008 Paul Miles. All rights reserved. May not be used without written permission. 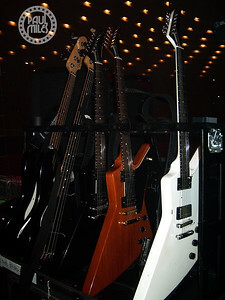 KAMIKAZE: Airbourne backstage in their Tokyo stadium dressing room minutes after their first-ever show in Japan, 2008. 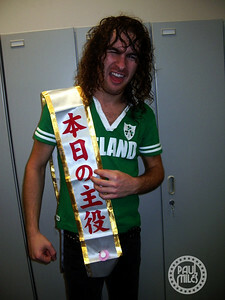 Airbourne front man Joel O'Keeffe backstage in Tokyo after the band's first Japanese show, sporting a gift from a fan that says "The Star of the Day!" 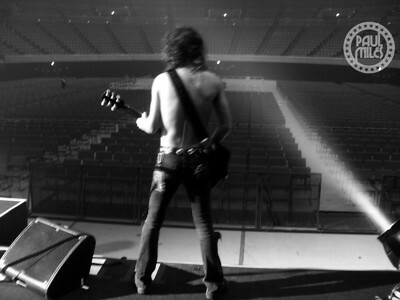 Joel O'Keeffe soundchecking on stage at Jo Hall in Osaka, Japan. 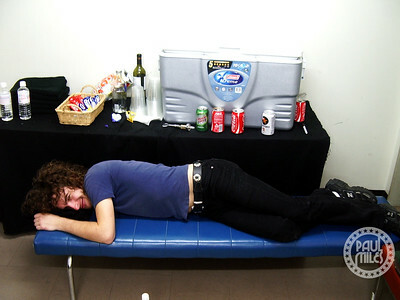 Joel O'Keeffe taking every opportunity to rest backstage.